Multi-reed virtuoso Alex Murzyn was born in Honolulu, Hawaii. 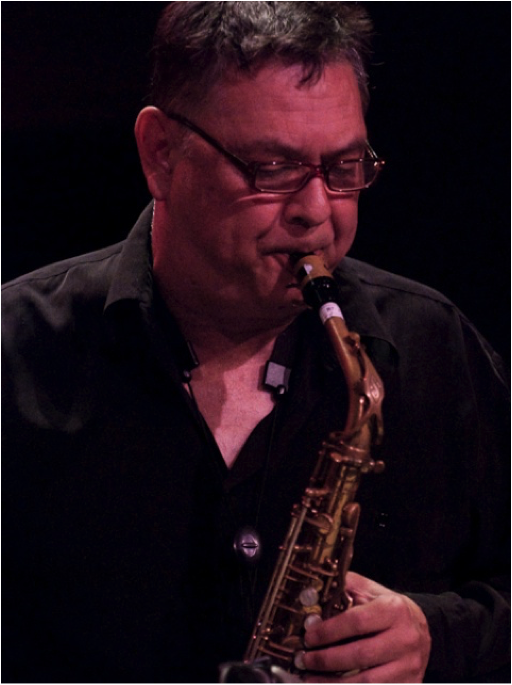 While still a student he began performing with Benny Rietveld, Ollie Mitchell, Gabe Balthazar, and Freddie Hubbard. After relocating to San Francisco he worked with Bobby Hutcherson, Pete Escovedo, Huey Lewis and the News, Sammy Davis Jr., the Temptations, the Four Tops, Dizzy Gillespie, Ray Charles, Arturo Sandoval, Ray Obiedo, Rebecca Mauleon, Bob Florence and Stanley Clark. He plays tenor sax, soprano sax, alto sax, flute, alto flute, piccolo, clarinet, and bass clarinet. Alex received his Associate of Arts degree from Berklee College of Music. He studied classical flute with Jean Harling, principal Honolulu Symphony, Michelle Caimoto, California Symphony, classical clarinet with Dianne Maltester, California Symphony, and saxophone with Vic Morosco, Andy McGee, and Joe Henderson. Alex’s three CDs of his own (“Alex Murzyn” (Kamei Records), “Crosscurrents” (Kamei Records), “For All People” (Monarch Records)) have received heavy airplay on radio stations such as the “Wave” in Los Angeles, and KKSF in the Bay Area. They were also rated as number six in the Gavin Report and seventeen in Billboard’s New Adult Contemporary category.